The case against Verkhovna Rada (unaligned) deputy Nadiia Savchenko and ex-head of Officer Corps Volodymyr Ruban who are suspected of actions aimed at violently changing or overthrowing the constitutional order or seizing state power will be heard at the Chernihiv District Court of the Chernihiv region. A respective decision was made by a panel of judges of Ukraine's Supreme Court on Monday, February 11. The prosecutor's office earlier sent a motion to transfer this case from the Sloviansk City District Court in the Donetsk region, to which it was originally sent, to the Chernihiv District Court of the Chernihiv region. On January 30, it became known that the first meeting for preparing hearings on the Savchenko-Ruban trial was scheduled for February 6 in Slaviansk City District Court, Donetsk region; however, later it was postponed until February 13. In their turn, Savchenko and Ruban's defense sent a motion for the case to be heard at the Pechersky District Court in Kyiv. 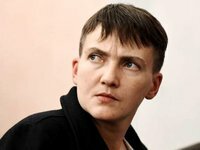 Savchenko has been in custody since March 23. Ruban was detained on March 8 at a checkpoint in Donbas with an arsenal of weapons that he was allegedly trying to smuggle into the territory under Kyiv's control. Ruban was arrested by the Shevchenkivsky District Court in Kyiv on March 9, 2018.